WHAT HAPPENED: The ‘Cuse (9-1) played like it forgot to wake up from its week long break for final exams until the final 5:00, coming all the way back from 12 down to tie the game, then dominated overtime to hand the Hoyas (8-1) their first loss of the season. ANALYSIS: At times it seemed like there was more action during the TV timeouts and at halftime with students shooting for free books, individuals being honored by Georgetown for longtime service, and an agile unicycle performer spinning around the court, as both teams struggled putting the ball in the basket before the exciting second half Orange comeback. 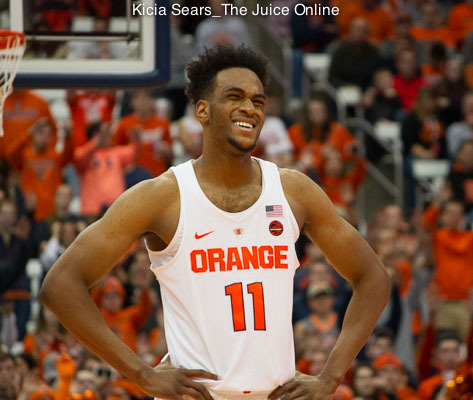 Tyus Battle and Oshae Brissett led the furious rally combining for 49 points, with Brissett grabbing 14 rebounds, while Frank Howard had 18 points. HERO: When the going got tough, Battle got going, finishing with a game high 27 points and some deadly long range shooting, to help spark the improbable comeback. ZERO: Where to start for about 35 minutes of the 45 minute game? Lackluster offense much of the day, check. Poor shooting on numerous trips down court, check. Not playing intense zone defense, check. Foul trouble, check. 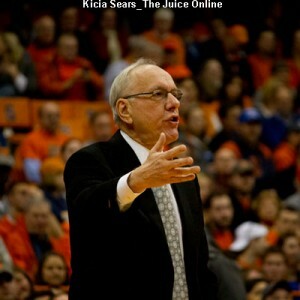 The Orange had regressed from its play in the loss to then-No. 2 Kansas and wins over Connecticut and Colgate before staging the incredible rally. SU finally buckled down on “D,” unnerving a young Georgetown team that had not played a team the caliber of SU in its first nine games. WHAT’S NEXT: Syracuse returns home to finish out its non-conference portion of the schedule with three games prior to New Year’s Eve, beginning with a match-up against Buffalo on Tuesday night, Dec. 19. The Orange and UB last met in the 2001-02 season with SU winning the last 17 games dating back to the 1963-64 campaign. The Bulls (6-3) hosted Robert Morris Saturday afternoon. Game time: 7:00 p.m. 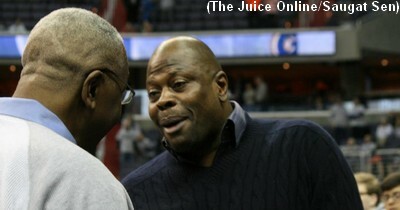 ET / TV: ACC Network Extra.